Jacob Royce was born perhaps about 1784. 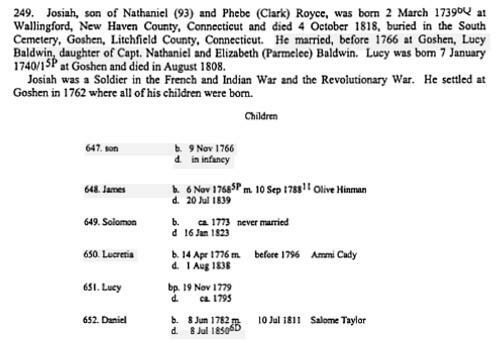 Jerusha Royce was probably born after May 27, 1762. There is much confusion over the identity and birth year of Jerusha Royce. Some sources give her birth year as 1756. Given that "Jerusha" was the name of Robert's second wife, and they didn't marry until 1762, this seems unlikely. Other sources say she was born about 1776, which would make a 1781 marriage impossible. I am unable to access the original source for any of this information. Ruth Varney Held, James Sparrow and Eliza Payne Morse of Boardman and lower Salem, Ohio: their ancestors and descendants, , at https://books.google.com/books?id=hltVAAAAMAAJ . San Diego, Calif.: Held, (1979) , p. 52. Alvin Lee Rhods, The Royce Family in America, , at https://books.google.com/books?id=e-5OAAAAMAAJ . Madison, AL: (2005) , p. 25. Alvin Lee Rhods, The Royce Family in America, , at https://books.google.com/books?id=e-5OAAAAMAAJ . Madison, AL: (2005) , p. 24. Norfolk (Conn.). 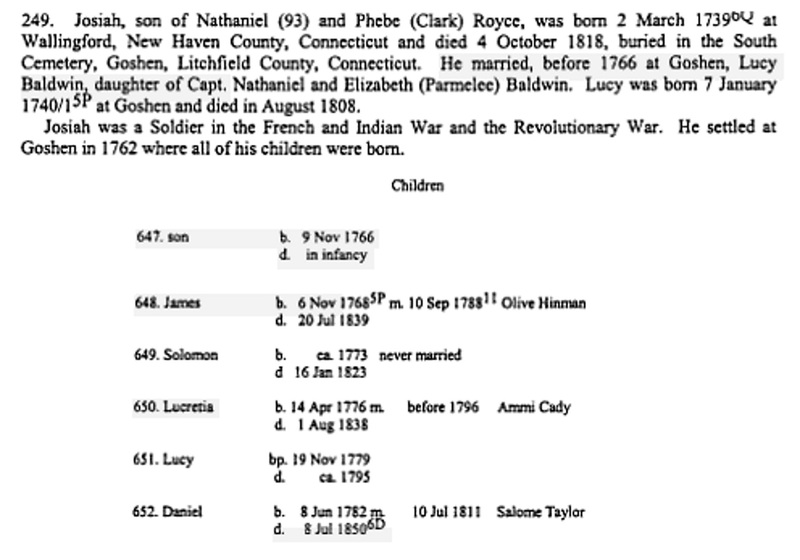 Church of Christ, Baptisms, marriages, burials and list of members taken from church records of the Reverend Ammi Ruhamah Robbins, first minister of Norfolk, Connecticut, 1761-1813, Printed for C. and E. B. Stoeckel, (1910) , p. 60. "United States Census, 1850," database with images, FamilySearch (https://familysearch.org/pal:/MM9.3.1/TH-266-11546-57265-0?cc=1401638 : 9 April 2016), New York > Broome > Triangle > image 4 of 43; citing NARA microfilm publication M432 (Washington, D.C.: National Archives and Records Administration, n.d.). Homer Worthington Brainard, A Survey of the Scovils Or Scovills in England and America: Seven Hundred Years of History and Genealogy, Hartford: Privately Printed, (1915) , p. 373. Donald Lines Jacobus, Families of Ancient New Haven, Volume 3; Volumes 7-8, , at https://books.google.com/books?id=ibMRAQAAIAAJ . (1922-32) , p. 1566. Martha Royce was born perhaps about 1704.